The following is taken from a chapter of Candle of Vision by A.E. (George William Russell), published in 1918. The chapter is called The Celtic Imagination. To one who lay on the mound which is called the Brugh on the Boyne a form like that the bards speak of Angus appeared, and it cried: "Can you not see me? Can you not hear me? I come from the Land of Immortal Youth." 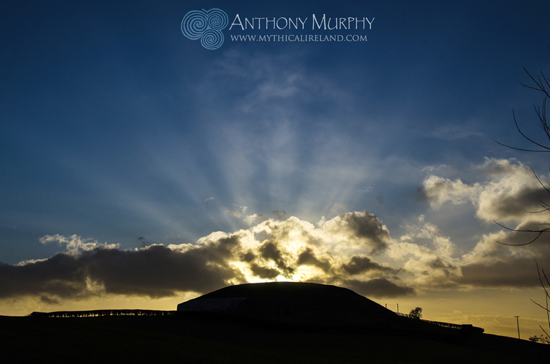 Angus appeared at Brugh on the Boyne (Newgrange). He came from the Land of Immortal Youth. And I, though I could not be certain of speech, found the wild words flying up to my brain interpreting my own vision of the god, and it seemed to be crying to me: "Oh, see our sun is dawning for us, ever dawning, with ever youthful and triumphant voices. Your sun is but a smoky shadow: ours the ruddy and eternal glow. Your fire is far away, but ours within our hearts is ever living and through wood and wave is ever dawning on adoring eyes. My birds from purple fiery plumage shed the light of lights. Their kisses wake the love that never dies and leads through death to me. My love shall be in thine when love is sacrifice." .... Some interpret the spirit with sadness and some with joy, but in this country I think it will always cry out its wild and wondrous story of immortal youth and will lead its votaries to a heaven where they will be drunken with beauty. What is all this? Poetry or fantasy? It has visited thousands in all ages and lands, and from such visions have come all that is most beautiful in poetry or art. These forms inhabited Shelley's luminous cloudland, and they were the models in the Pheidian heart, and they have been with artist, poet and musician since the beginning of the world, and they will be with us until we grow into their beauty and learn from them how to fulful human destiny, accomplishing our labour which is to make this world into the likeness of the Kingdom of Light.